This guy! And all his buddies. Today's nails are Spongebob nails! I did a blue gradient using Julep Robbin and Julep Annie, hand painted some nautical flower clouds and then added all my favorite Spongey characters. Topped off with Butter London's matte top coat to give it that extra 2D cartoony effect. Okay, this is friggin amazing! 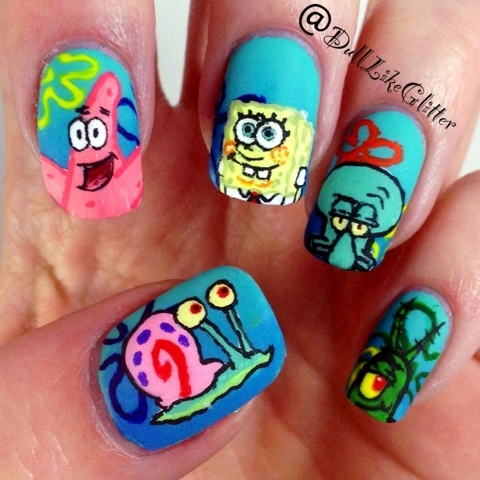 Probably the best spongebob nails I've EVER seen!!! I love spongebob! Seriously, i collect spongebob stuff. Wish i had your nails in my collection, 'cause these are AWESOME!!! !